Where did Carolina Preserve place among popular communities in North Carolina last year? North Carolina is home to many desirable active adult communities that offer residents just about anything they could want. From championship golf courses right on the premises to ballroom dancing, resort-style pools and endless amounts of social activities, there’s a community that has it. It can be overwhelming to even know where to begin the search for the right community to suit your lifestyle. To help get that search started we’ve put together a list of the top 55+ communities in North Carolina based on 55places.com page views throughout all of 2018. Located in the charming, seaside town of Southport the community of St. James Plantation was originally built in 1991. Today, the large, gated community has grown to hold more than 1,800 single-family homes and condos — with plans to eventually have 5,000 homes upon completion. Homes throughout St. James Plantation have been built by multiple builders, giving residents a vast amount of choices to choose from when it comes to the look and feel of their new homes. Notable amenities include a private beach, a full-service marina, an on-site market, a number of gardens and parks, plus the Woodlands Oak Amphitheater. There are also four different clubhouses for homeowners to join — each clubhouse offers a variety of their own amenities that range from on-site restaurants to 18-hole championship golf courses. The Brunswick Forest community located in Leland is spread over 4,500 acres of woodland and features a variety of single-family and attached homes. Final plans have the neighborhood encompassing a whopping 8,000 homes. Townhomes in Brunswick Forest range from 1,133 to 2,254 square feet of living space, while single-family homes start at 1,011 square feet and go up to 3,511 square feet. The community’s list of amenities includes an 18,000 square-foot fitness center that is home to a variety of cardio and weight training equipment as well as an indoor pool, aerobics studio, steam and massage rooms. Outside, there’s a pool, sundeck, cafe, tennis courts, golf course, and 40 miles of trails for walking and biking. Along with the many amenities Brunswick Forest has to offer homeowners, the community is also conveniently located only ten minutes away from historic downtown Wilmington. The Del Webb community of Carolina Preserve is a 55+ community with 1,268 homes that are available only on a resale basis. Houses range in size from 1,217 to 3,500 square feet of living space and have up to four bedrooms, three-and-a-half bathrooms, and an attached garage. Amenities include a 34,000 square-foot clubhouse, three ballrooms, four clay tennis courts, a fitness center, indoor and outdoor pools, and a 15-acre lake. Additionally, the neighborhood boasts more than 100 organized clubs and interest groups for homeowners to join and participate. The cities of Raleigh, Durham, and Chapel Hill are close by making it easy for Carolina Preserve residents to take advantage of all the cities have to offer. This established, gated-community was originally built in 1972 in the mountain town of Brevard and has continued to grow ever since. Today, Connestee Falls has 1,300 homes with a mixture of single-family and attached homes as well as condos. Potential residents can take their pick from resale homes or choose to build something brand new in the community. Attached homes in Connestee Falls range from 1,200 to 3,000 square feet while single-family homes start at 1,300 square feet and increase up to 5,000 square feet. The development’s amenities are extensive and include a 26,000 square-foot clubhouse, performance theater, sports grill, lounge, 18-hole golf course, pro shop, lounge, several athletic courts, scenic lakes and docks, plus, 13 miles of walking and biking trails. 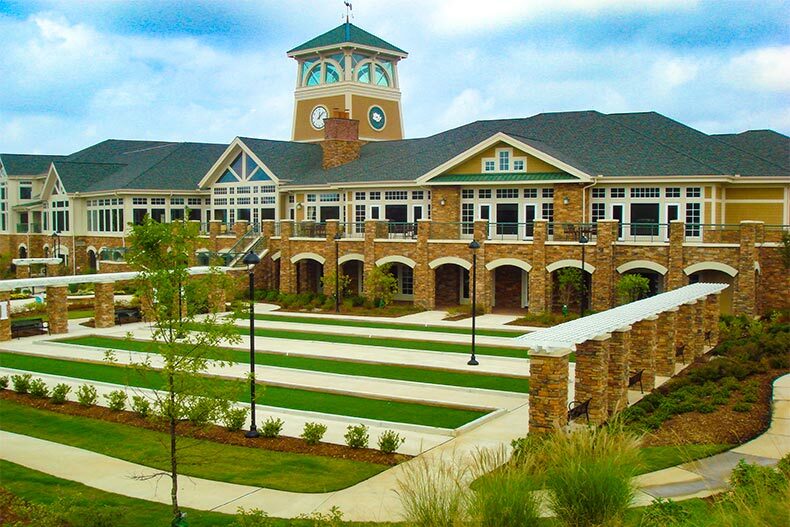 Rounding out the list of the top five retirement communities in North Carolina is Del Webb Wilmington, a gated, age-restricted neighborhood which was built in 2016. It is part of the RiverLights master-planned community and only has new homes available. There are three home design collections for potential homebuyers to choose between. The smallest homes in the community are 1,262, while the largest floor plans have 2,565 square feet of living space. Noteworthy amenities include a 15,000 square-foot clubhouse, multi-purpose room, fitness center, indoor and outdoor pools, an event lawn, and walking and biking trails. There are also tennis, pickleball, and bocce ball courts for neighbors to strike up a little friendly competition.